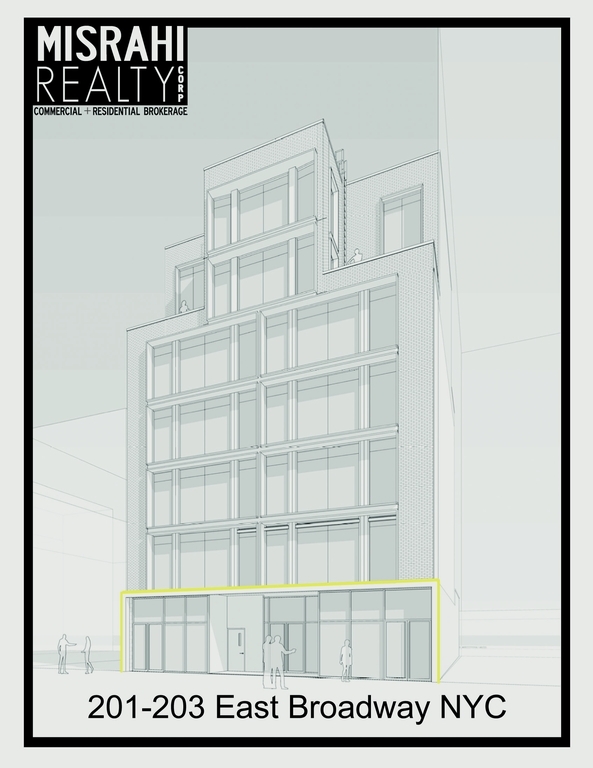 Commercial condominium for sale on the ground floor and basement of 201-203 East Broadway, NYC. The commercial ground floor offers 3,594 sq ft with 13 ft ceilings, and approximately 40 feet of frontage. It includes 416 sq ft of lower level storage space for a total of 4,010 sq ft. The site offers brand new construction featuring a steel and concrete structure. The 7 story luxury residential floor-through units above will incorporate the first high end modular condominium project ever completed below 96th Street in Manhattan. The Lower East Side is home to over 130 galleries, many of which have relocated from Chelsea where they were displaced due to rising rents. The advantage of ownership in this rapidly changing neighborhood is tremendous. In the past year alone, the Essex Crossing Development Site is slated to build over 1,600,000 sf of office, retail, and residential space, only 3 blocks from this property. The Lowline is due for completion in 1 year, and will offer the first underground park in the United States. In addition, 54 Canal is currently under construction and will offer 60,000 sf of creative office space 2 blocks from this property. This property is situated in the heart of the LES gallery district, now home to 9 hotels and some of the biggest names in the restaurant industry, and this opportunity will not last. We welcome you to work with the owner to install custom fixtures, and design the perfect space for your business.